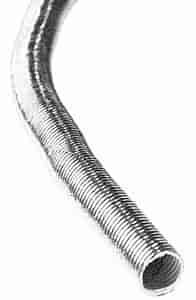 Thermo Tec Thermo-Flex Aluminum Sleeving 1-1/2" x 10"
Thermo-Flex Insulation is the perfect solution for hose and wiring containment uses that need heat protection. Built to withstand temperatures up to 750 degrees. Provides abrasion resistance in a lightweight flexible format. Can be slit to go over wire looms without having to disconnect the ends of the wire or hoses. 17150-10 is rated 5.0 out of 5 by 1. Rated 5 out of 5 by Easterner from Works well I bought this to insulate the gas lines under the hood and it cured the vapor lock symptoms.